The latest euro zone GDP figures all came in the red, with the entire region posting a 0.2% economic contraction for Q1 2013. Germany, euro zone’s largest economy, showed weaker than expected growth of only 0.1% while France printed a 0.2% decline in GDP. These were enough to push euro zone deeper into recession, as the region chalked up its sixth consecutive quarter of negative growth. It doesn’t help that leading indicators are hinting at a further slowdown in the near term. The German ZEW economic sentiment report for May printed a 36.4 reading, lower than the estimated 39.5 figure. Meanwhile, manufacturing and services PMIs for both France and Germany are all hovering below the 50.0 mark, which means that those sectors are still in contraction. Given the region’s weak economic performance, it’s no surprise that the ECB decided to cut rates by 25 basis points in their latest rate decision. And with more dark clouds looming on the economic horizon, ECB head Mario Draghi and his men might still need to dole out further stimulus. In fact, Draghi has been quoted saying that ECB officials are keeping an open mind about setting negative deposit rates. The ECB also has the option of buying corporate and long-term bonds in order to pump up liquidity and hopefully revive economic activity. EUR/USD: Just broke below a rising support line and is currently trading below the key 1.3000 psychological level. EUR/GBP: Bounced off a falling resistance line at .8500. Yesterday’s candle was also very bearish, which raises the question of how long .8400 can hold. 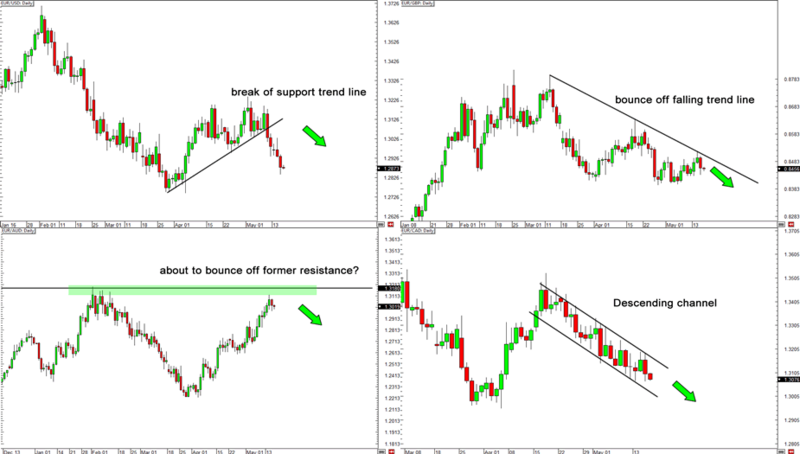 EUR/AUD: Approaching key resistance at 1.3180, the 2013 high. Bears will definitely be keeping an eye at that level for a reversal. EUR/CAD: Over the past month, EUR/CAD has been on a steady decline and there aren’t any signs that may reverse soon. Of course, this doesn’t mean you should start betting your mansion, Porsche and your vintage watch collection on an all-out short euro position. Read up, do your analysis, and keep your risk in check! Are you a euro bull or bear?